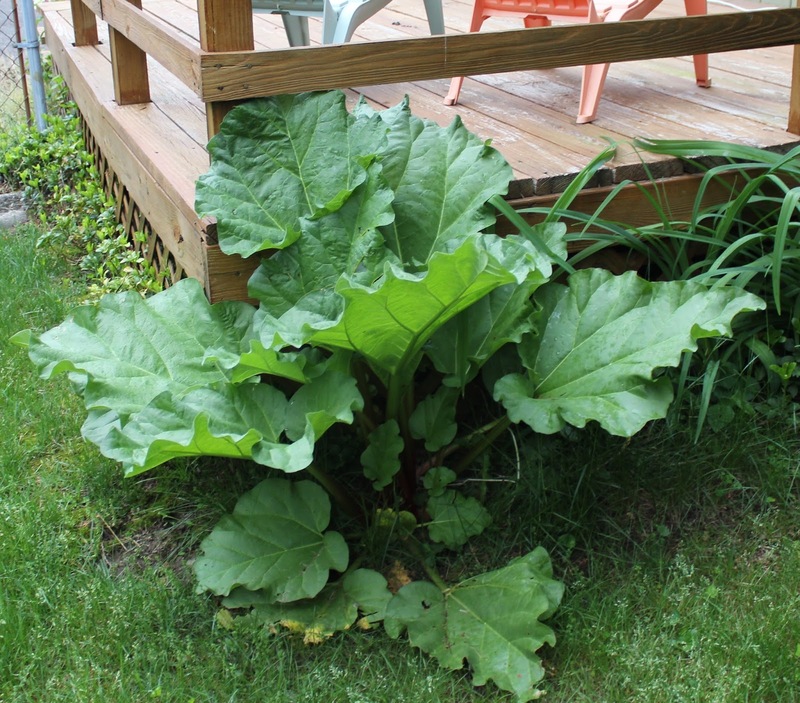 This year I've got a bumper crop of rhubarb. Of course, the thing I love to make most is rhubarb chutney, but I made so much of it two years ago, that I haven't even started last year's jars. And -- holy cow, did I mention that bumper crop??? Luckily, Mr. L loves rhubarb ANYTHING. In years past, I've made him rhubarb crisp and strawberry-rhubarb pies. My folks used to like stewed rhubarb with Bird's custard. 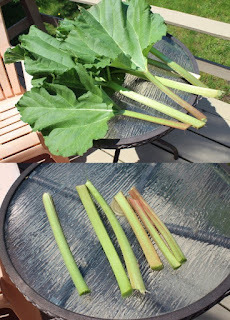 I'm going for rhubarb bread and here's the recipe I'm using. Preheat the oven to 350ºF (180ºC, Gas Mark 4). Mix the oil, brown sugar, and egg together in mixing bowl. Alternate with flour, salt and soda. Add buttermilk, vanilla, rhubarb and walnuts. Bake in a well-greased tube pan for 34-55 minutes. Test with a toothpick to see if done. This recipe tastes better the day after baking. Refrigerate any leftovers. Keeps well in the freezer for several weeks. What's your favorite rhubarb recipe? The roses are just starting to bloom in my garden. This was supposed to be a climbing rose, but after a decade, I've given up hope. 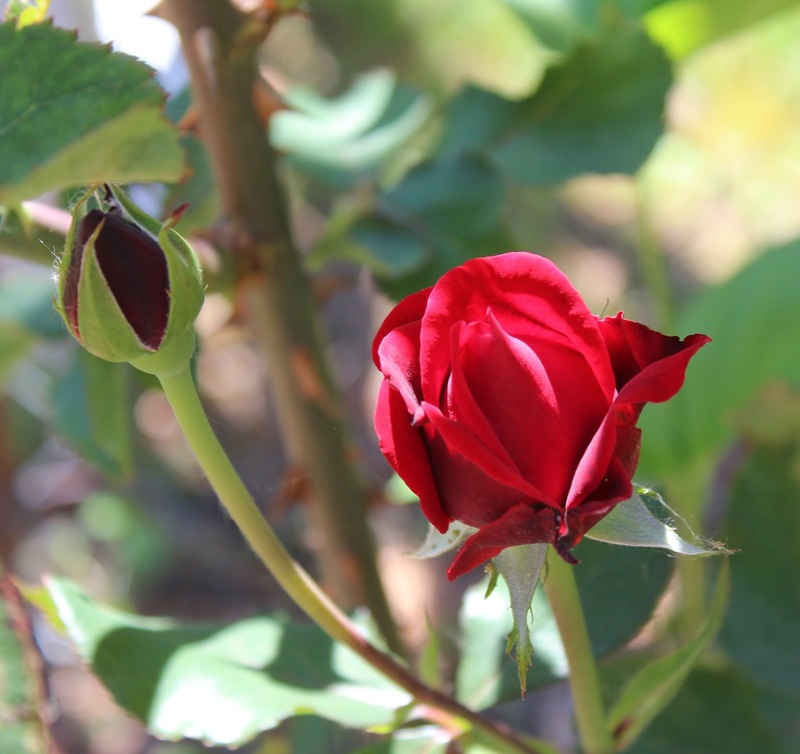 Three of my knockout roses are in bloom, with another two waiting in the wings, and the huge "old rose" bush I cut down to nothing in April has totally grown back and will be festooned with blooms in another week or two. Yee-ha! First of all, I don't like bugs. But even I can't dislike Monarch butterflies. They're just so pretty. Nice Halloween colors, and look pretty so pretty when they visit my garden. But the Monarchs are endangered, so I'm going to do my part to try to keep the species alive. How will I do that? By adding milkweed plants to my yard. I can remember seeing milkweed plants as a kid, and people didn't like them seeding up their yards and yanked them out, maybe not knowing how important they were to the Monarchs. I also remember seeing the (icky) Monarch caterpillars as a kid, but I haven't seen one in probably thirty years. But where do you get milkweed? Finding seeds was just a google search away. So I ordered some--150 seeds for $1.95 and no shipping. That's way too many seeds for just me, so I'm going to share them with my neighbor's children. They raise preying mantis, so I figured if they like bugs, they probably would like to help out the Monarchs. I probably will be grossed out by the caterpillars, but ... I want to see more monarchs. So -- milkweed is in my future. Are you interested in helping the Monarchs? Yesterday, Mr. L and I got our taxes done. Not fun. (Especially since we owe.) So, to cheer ourselves up, we went to the garden store. Oh, it was WONDERFUL! The big greenhouse doors were open and you walked in and all the spring flowers were in bloom. It smelled heavenly. I know a lot of you in warmer climates have your gardens up and going. Tell us what's blooming! 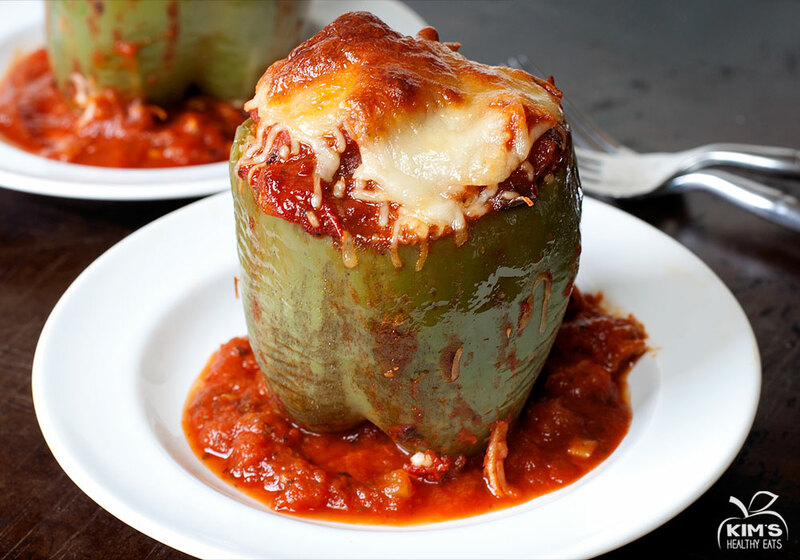 Tomatoes and peppers and a recipe! Oh, my! As a follow-up to Saturday's post, I thought I'd talk about my veggie garden. Look what sprouted in my compost bucket! I hope it's a delicata squash. It could be a cucumber, but I don't usually seed my cukes, so crossing fingers it's delicata. I bought one zucchini plant at the garden store and it's going to have a LOT of blossoms and already has one tiny zucchini. My lettuce is going great guns. The two largest plants in the middle of this next picture were self-seeded from last year. I planted two different types of lettuce, but they look pretty much alike to me. I've got green beans on the upper right (which will be wanting to climb any day now) and basil and curly parsley in the bottom right. Still hoping to plant some pea pods for stir fry later this month when I get some help with the veggie patch--and also a couple of tomato plants. So far, I'm pretty happy with my little container garden. Aren't these pansies gorgeous? They've been my favorite flower ever since I can remember. My mother used to plant them along the walk in our first house and they always looked to cheerful. I only have three pansy plants (so far) this year, and they were self-seeded. 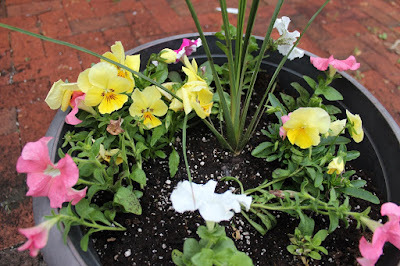 Mr. L planted some ice pansies in our garden containers/urns after the other flowers started to wane last summer. I want to get more, NOW--they're just so pretty. AS PROMISED back on January 23, an update. Unlike three of my Cozy Chicks blog sisters, I have not had the opportunity to visit the tropics this winter season. This LONG WINTER season. But, in a small way, the tropics have visited me. One of my orchids has decided (after a VERY LONG TIME) to bloom again. Mr. L noticed in early January that not one, but three of my five orchids looked like they might be setting up buds (if that's what they're called. I don't claim to be an orchid encyclopedia--I just like them). We watched, and waited ... and watched, and waited ... and (*sigh*) watched and waited. It seemed to be taking an awfully L-O-N-G time for the damn thing to bloom. But finally, this week, it bloomed. I had been hoping it would be the yellow one to bloom, not the more common purple, but at this stage, I'll take what I can get. Alas, we thought we originally thought were going to get three blooms, but only as you can see, it only produced two. The second one seems stalled in stasis land. And the miniature one is in stagnation land (where it was when Mr. L first noticed). So I'm just as pleased that Mr. Purple Orchid has bloomed. And I hope they hang around for a long, long, time. Do you grow orchids (or in my case enable them to survive, but not necessarily thrive)? Despite this repeat of Laura Ingalls Wilder's THE LONG WINTER, spring must be in the offing. All the stores are selling seed packets. I picked up a few myself! 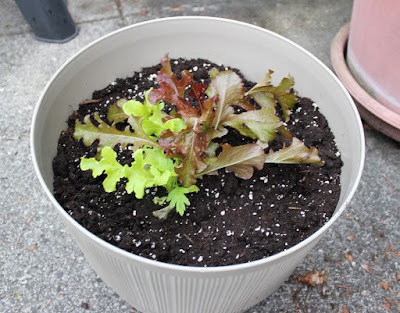 Because of all the critters, I'm going for container gardening. I've got a deck that gets sunlight most of the day. 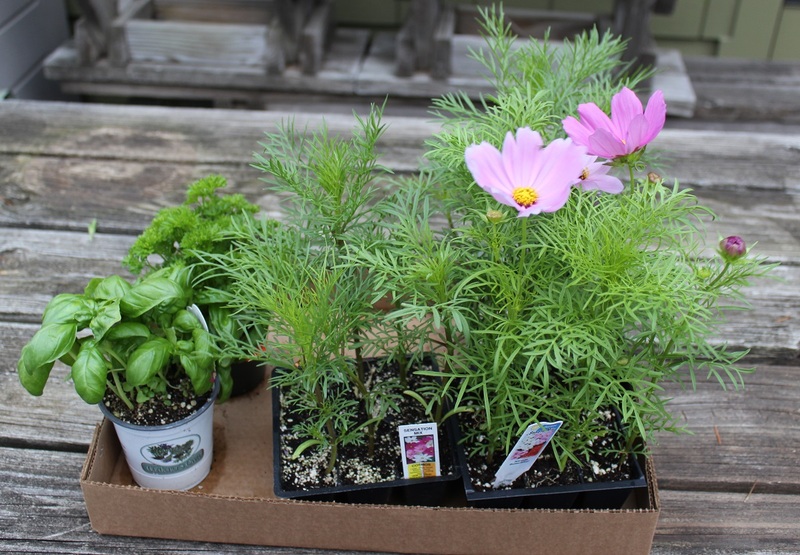 I've got a bunch of other herbs I'm going to plant, too. What are you going to plant this year? Spring Is Almost Here - Get Your Garden Ready Now! Leave a comment--win a mug? Our yard is a work in progress. We've been working on it for the past few years. For a while, it was the scariest house on the street thanks to the overgrown landscaping. We had that addressed last year, and it must not be scary looking anymore as we went from 1 or 2 trick-or-treaters to about 50 last fall. Yup, the yard definitely looks better. On this year's agenda is ripping out the last of the ivy that covered a big chunk of the front and back yard. Nice looking ground cover -- but it takes over and is extremely hard to eradicate. Ask us -- we ripped out an area about 4 x 12 feet and nearly died of cardiac problems. There's one left patch and we're paying for strapping young men to dig it out. But the major reason for ripping it out is that it hides mice. Lots of them. I'm sorry, but real mice aren't cute. They don't wear lederhosen and sing and help Princesses get the Prince. No, they take up residence behind your dishwasher and poop on your dishtowels and silverware. If that doesn't freak you out, I don't know what would. But, as usual, I digress. The guy came, gave us an estimate on the cost of ripping out the weeds and a lot of rogue columbines on our side yard (in addition to the ivy) and now we're waiting for the work to be done. Except ... the day after the guy came, somebody came in dug up every last columbine. Now, these weren't the pretty pink ones, these were plain old purple. I mean, who'd want them? It wasn't our neighbors. We'd have seen them transplanted in their beautifully maintained yard if that was the case. And by the way, our neighbors have been systematically renovating their home since they moved in (we're talking new fireplace, new bathrooms, new kitchens, all new rugs and floors) and have a beautifully landscaped yard. But they have one blind spot -- literally. They have no window that overlooks their side yard that butts up to ours -- where we want the weeds removed and replaced with mulch. They've had a dirt pile there for three years. The first winter it was there, they covered it with a big piece of plastic -- that flapped in the wind EVERY SINGLE NIGHT FOR FIVE MONTHS. How do I know? Because I sleep by the window that overlooks that portion of their yard. The plastic disintegrated long ago. Half the dirt pile has blown away. It's got weeds growing all around it. It's ugly. I know they see it when they cut their grass, so why don't they GET RID OF IT? We're not on the kind of terms where you say, "Hey, NAME-NOT-GIVEN-TO-PROTECT-THE-GUILTY, when are you going to move that dirt?" We nod and say hello, but that's about the end of it. Maybe I should print out the above picture and mail it to them? What do you think? One of my favorite books is The Secret Garden by Frances Hodgson Burnett. I read it every year. It's a wonderful story (except for the ending, where suddenly the heroine of the story gets lost and the focus completely turns on one of the secondary characters. Ahem!). In the book, a little girl, her friend (Dicken) with apparently magical relationships with animals, and the girl's cousin transform a badly neglected garden. Dicken's animal friends are sweet, cute, and THEY DON'T EAT ALL THE PLANTS. Unfortunately, the animals around my neighborhood, do. This past winter was mild. I had tried growing Brussels sprouts in containers to keep the groundhogs from eating them. It worked, but they plants did not thrive. In early September, I put the strongest plant in the garden to see if it would grow. It didn't. But it did survive the winter. And then it took off like crazy! Oh, what a thing of beauty. We had a spate of warm temps last week and it shot up at least 12 inches. And then Mr. Groundhog found it and ate EVERY SINGLE LEAF in about an hour. We had planted out peas about 4 p.m. An hour later Mr. G snuck into the garden and decimated the poor plant. We set the haveahart trap out to try and catch him, but why should he return? He's already eaten what he wanted, and apparently cabbage isn't as satisfying a dish as sprouts leaves. Every year I'm heartbroken when all my veggies (and flowers) are attacked and eaten by critters. Every year I hope it's going to be different. It never is. When you've got the gardening gene (and my parents were marvelous gardeners), it's something you do, but man is it heartbreaking at time. Do you find gardening heartbreaking, too? The other day it snowed overnight. (Is that an oxymoron? Anyway, it did.) The snow was the wet, heavy spring type snow. And it melted by lunchtime. The daffodils are up by several inches. Now we're waiting for the snowdrops. It's been a mild winter, but it's still winter. I'm ready for warm weather. Zephyr breezes. Planting my snow peas (and I'll do it on time, this year). I'm ready for spring. How about you? For the past few weeks we've been drowning in tomatoes and green beans. Not a bad was to go, eh? Friday I realized I had forgotten about my potato crop. The potatoes had a rough summer. Mr. Groundhog kept eating them down to about the 2-inch level. Then one day, he said, "I've had enough potato leaves" and went out to the farm to destroy a large part of their eggplant crop. So, the potatoes soldiered on. They never had flowers and I figured we'd never get any potatoes, so I more or less forgot about them. Until Friday. By Friday, most of the leaves had shriveled up. I looked around the weed-strewn patch and thought, "I'll never find them." But, I dug where I thought they might be and sure enough I found them. Aren't they cute? We had some (with parsley from the yard) the other night. Yum yum! Oh, how I lamented the loss of half of my bean crop. Mr. Bunny (Groundhog ... whatever) ate HALF of my beans. Nipped them right at ground level, ate a couple of leaves, and left the rest of the plant to die on the poles. Mr. Bunny got dispatched to the Police Academy (thanks to Animal Control) and the rest of my bean crop was safe. And boy, as a memorial to their eaten brothers, have these guys gone into overproduction. We're up to our eyebrows in beans. But then, I always overplant because I expect Mr. Bunny's relatives to eat at least some of them. It's been very difficult to pick the bean crop. Hurricane Irene didn't bring any rain our way, but we sure got a LOT of wind and it blew over not only the bean poles, but the tomato cages, too. Everything's a mish-mash and it's hard to get in and find the beans. But Friday we picked half a grocery bag of them because there's no way we could eat them all now. And thus began the job of freezing them. Since it's been so hard to pick the beans (there's a fence to contend with, plus we're trying to grow new grass on the other side of it), a lot of them are far too big and tough to eat. No problem! We've had problems getting seeds for the variety of beans we prefer. And, in fact, most of this year's crop was from seeds I collected two and three years ago. They came up just like clockwork. The pile of beans on the right are just some of the ones I'm drying for next year's seed crop. After blanching, they went into the ice bath (which in this case happens to be the top of my Tupperware cake tote). By the time we'd sorted through the beans, we got six bags to freeze. I estimate we'll have at least that much to do today, too. Yeah, we could buy a bag of frozen beans for $1.99 that would probably last us for 2-3 meals, but this is so much more satisfying. I guess only another gardener would understand. What have you frozen or canned from your veggie garden this year? By the way, today I'm guest blogging on my friend Dru-Ann Love's blog, Dru's Book Musings about my new cookbook, RECIPES TO DIE FOR. I hope you'll come by to see what Katie Bonner has to say about the book. Every year I (attempt to) grow beans. I've learned in the past that once they start to climb, they're usually safe from critters. I put down dried blood and that usually does the trick. Well, I ran out and something ate all but two of my potato plants. While waiting for another shipment to arrive (purchased via the Internet), something attacked my beans. It just chopped them about six inches from the ground, but they're all withering and dead up above. Now, I'm an animal lover, but not when it comes to wild critters eating my garden. The dried blood arrived yesterday, and I gave the ground around the potatoes a good treatment, but not the beans. Since the critter was discouraged in the potato patch s/he went straight for the beans. You can bet I spread a liberal supply of dried blood around today -- but it's a day too late. Will we get beans this year? I sure hope so, but I'm not confident. What are the critters eating in your garden? Yesterday I worked in the garden for a little while. I planted my potatoes. For the past few years, I've been planting my seed potatoes in a big blue tub. Not this year. The yield was too small, so back in the ground they go. I have limited garden space, so they're going in behind the black-eyed susans. Unfortunately for me, the phone rang in the middle of planting. Since we have a wireless landline (yes, we're still dinosaurs and haven't gone totally cell yet ... maybe not for a long time), Mr. L brought the phone out to me and I had a rather long conversation with my brother. I continued to plant my potatoes, which was rather awkward to say the least. Everything was okay until bedtime when I realized "Ouch, my back hurts." Only in one spot and I think it's because I was holding the phone in an awkward position for about ten minutes. Look what came up in my yard!!! I know some of you live in places where the spring flowers are already in bloom or -- heaven only knows -- done for the season! What is it you like best about spring? You know your life is boring when . . .
Today is the second errand day of the week. Wednesday's errands started off with turmoil because it was snowing. Supposed to be sleeting. I didn't want to go, but Mr. L said the weather might get worse. Left the house with a cloud of blue above me (um...my language was a tad salty. Hey, I worked production in a machine shop for 18 months. I earned every one of those blue words). But I still had a Christmas CD on in my car so by the time I hit the high school (about a minute into my grocery store commute), I had cheered up considerably. The fact that the roads had been heavily salted and were merely wet made my joy complete. Still, I thought I deserved a treat for braving the winter chill and stocking up on supplies in case we were snowed in for a month. Important stuff like cat treats, cat litter, gummy orange slices, ham hocks and guitar strings. I wasn't about to treat myself to a package of Vienna Fingers or Nutter Butter cookies. One of the hazards of authordom is a widening buttox, from which I already suffer greatly. So, I stayed right out of the cookie aisle. But still, I deserved a treat for mushing to the store to keep my tiny family (two people and four cats) from starvation. And then I saw it (actually THEM): Two twirly racks of SEEDS. Seeds mean spring is coming. Seeds mean life returns to the once-frozen earth. Seeds mean veggies fresh from the garden. Only . . . I couldn't decide what to get, and it's really far too early to start plants for outside. So I settled on a package of cilantro. Weee, I'm planting cilantro that can live happily on my kitchen window sill! When I have leaves, I can cut them and put it on my Aloo Matar! I could toss it on a taco! Weeee! Today my mother has a doctor's appointment and she was told it would take at least 90 minutes. As designated daughter, it's my duty to take her there. But I have errands to run. I'm heading to K-Mart for long underwear (if they still have any). Got a post office run to make. And, the craft store has stickers on sale for a buck! Yes, you know your life is boring when $1 stickers can actually entice you. And when I get back, I'll jump back into the book. There's a teensy problem with . . . oops--can't say it. Spoiler alert! What tiny thing in your life brings you joy that can compare to $1 stickers? As reported yesterday, Mr. Landscaper came to visit and brought his Bobcat. We had talked about getting just the landscaping on the left side of the house removed. He, and his young helper (son?) went right to work and started ripping out overgrown landscaping. Once we saw how open it was, we asked him to start ripping out the stuff on the other side, leaving the HUGE rhododendron in the middle. Okay, first of all, we rarely go in our front yard. I usually approach the house from the north and to tell you the truth, I knew the landscaping was overgrown, but until I saw this picture, it just never registered. As Mr. L said upon seeing it, "No wonder we never got any trick-or-treaters." As we stood in the cold watching all the action, we started thinking about what we wanted for the front of the house. As I stood there watching, I was reminded of all those episodes of Curb Appeal I've been watching and man, is our house in desperate need of some curb appeal. It's ... ugly. We just never knew it because the landscaping was so overgrown. I mean, even when we bought the house it was overgrown so we never really saw the front. Man, it's worse than ugly. I can see a trip to the paint store and the architectural salvage yard in my future. After Mr. Landscaper left, we stood looking at the rhododendron and thought -- we should have had him pull that out, too. But I wanted to see it bloom one more time. Now I realize . . . it's only pretty for one week of the year. It needs to go. Over the winter, we're going to think about what we want for both the house and the yard. In the meantime, how would you make the front of our house look better? I've said it before and I'll say it again. I hope they don't get rid of Saturday mail delivery, because you never know what treasures will show up in your mailbox. The other day, there was a little package in mine, and it came from a reader. (Hi, Donna!) Donna reads this blog and the troubles I've had with my bean crop. In fact, an almost total bean failure (at least at the cottage--the third planting (with different seeds) seems to have taken at home). So, Donna sent me some pole bean seeds from California. Yee-ha! How cool is that? The snow peas crop has been exceptionally good. In fact, we can't seem to shut them off. We've been eating sauteed mushrooms with pea pods for about two weeks now. Hubby is getting sick of them, but I don't think I ever will. In fact, I seem to enjoy beans (in any form) more every day. So what do you see out of your favorite window? Last year we bought a clematis. It wasn't our first one. Or even our second. Those were eaten by some rodent with fur and a twitchy nose. So instead of shelling out the usual $5 -- we went for an ESTABLISHED plant and shot the wad at about $25. Still, for the price, this little guy was kinda beaten up, thanks to a hail storm that had hit a few days before. But we planted him and hoped for the best. The best didn't happen in 2009. Mr. Clematis existed. Hubby was depressed. Yup, I think he survived the winter. I should do a commercial! For years, I've had a war going on with the bunnies of this Earth. They've eaten my crops, growing fat and sassy, and nothing I tried would keep them from enjoying a delicious salad, mostly from my tiny tender green bean seedlings. I tried fencing, I tried moth balls. I was told to have all my male friends and relatives take a wiz around my garden perimeter. (Uh, we didn't try that one.) Nothing worked against stealthful bunnies. Plantskydd Deer Repellent works by emitting an odor that animals associate with predator activity, repelling the animal before it nibbles on plants. The odor is not unpleasant to the applicator. Of course, this year we had a problem even BEFORE we could get out the Plantskydd -- and that's getting the beans to actually pop out of the earth. Years ago, we used to buy our beans by the pound (and usually never more than 4 ounces at a time) from a little farm stand along Route 104 in NY. But then they stopped selling it that way and we had to revert to seed packages. Some years we haven't had enough rain--this year, whoa! Turn off the sprinkler, God! The package advises you to soak the beans (which we have always done) for quicker germination. This year, I think between soaking and Noah's Ark type rain, the beans rotted in the ground. But now the tiny plants have pushed their first leaves up through the soil, struggling for sunlight, warmth -- and a decided LACK OF BUNNIES! Yup, it's all out (non violent) war against critters who'd invade my garden. Yesterday, we decided it was time to get going in the garden. Not that we haven't been doing things all along. We finally (after a week) dug a hole and planted the new azalea, which was kind of an adventure, since the bees were working on it and we didn't want to get stung. I pulled LOTS of weeds (and baby maple trees). I've kept the veggie garden covered with a tarp in an effort to keep the weeds down. It worked. But I'm getting ahead of myself. I've weighed down the tarp with rocks, flowerpots and pieces of slate (where they came from, I have no idea--they were under the deck). So I'm tromping all over the tarp, picking things up, moving them around and finally I grab the tarp and yank it up and ZOWIE!!!!!!!!!! there's a tremendous TOAD under the thing. I screamed and ran away. But then I found some courage somewhere and had to come back. I pulled the tarp off and laid it on the ground but didn't see the toad. Was I dreaming I'd seen it? Eventually he hopped under the deck, where he's free to live a happy life--just DON'T JUMP OUT AT ME, MR. TOAD. I never realized that toads ate bugs and slugs. I mean, bugs, maybe--but slugs? Go Mr. Toad--eat hearty! We pumped the pool off again after another heavy rain, but the polliwogs are still there. They don't seem to be growing much, but they appear to be having a great time swimming on the little rivers of water in the creases of the pool cover. They've got another two weeks and then they're history--one way or another. I'll be planting my beans this weekend, and hope to make a visit to my favorite nursery to get plants. So have you been making progress in your garden, too? Of course the peas aren't the only thing growing in the yard. I think all the perennials are up. And yesterday we bought an azalea to go into a corner that used to have a cotonieaster. (It grew too big and out of control and has now gone to cotonieaster heaven.) I wanted one that was an orangy-peachy color, just like my parent used to have when I was growing up, but apparently that color is no longer in fashion so I choose this pink beauty. We had hoped to put our bean crop in two weeks early, especially since we had such a lovely April . . . but we've had snow this week, and there predictions of several more heavy freezes, so I guess if I get the beans in Memorial Day Weekend, it'll have to do. I'm looking forward to a long, lovely summer growing stuff. How about you? The little snow peas seed packet said germination in 8-12 days. Yup, on Day 11 the snow peas sprouted. I thought they might have sprouted sooner. Old trick of the trade: soak your seeds for 24 hours before you plant them. This softens them up, and encourages them to sprout sooner. Well, these seeds said, "Forgot it, baby--we're not sprouting until we're good and ready!" And they didn't. It's always so satisfying to plant something and see it grow, and even better--be able to eventually eat it. Of course, that is if Mr. Bunny, Mr. Groundhog, or a herd of deer don't get there first. I've taken the precaution of liberally sprinkling dried blood around the snow peas and hope it discourages the local fauna. And what will your garden grow this year? It shouldn’t be surprising that a mystery author is guilty of wanton murder. Mind you, it wasn’t premeditated, but it was murder just the same. Take for instance the once-lovely primrose I’ve had for a little over a month. The day it arrived home it was flourishing with big purple and yellow flowers. Now it looks like this. Did I water it enough? Too much? Mind you, I have had a few successes, but I really can’t take credit for them. I inherited a rubber tree when a friend at work retired. It existed (you can’t call what my plants do “living”) in our dining room until all but four leaves had dropped off. With nothing left to lose, I tossed it out on the deck and forgot about it. It thrived on neglect and natural rain and humidity, thinking it had landed back in its homeland. I bring it in for the winter and it goes back to existing until late spring rolls around and the threat of frost is minimized. Then it goes back to its happy lifestyle for another three to five months (depending on when fall arrives) until I have to bring it in once again. My Christmas cactus never bloomed and looked ill when I tossed it, too, out on the deck last May. This year it’ll bloom twice. (Although this second blooming won’t be as magnificent as last fall’s.) I find it amazing that I haven't killed it since it came in last October. On this first day of spring, I’m hoping the primrose survives. If it makes it, it’ll go outside (I’m having a novena said for it). I’ve also got another cactus that can go out on the deck. So far, it has a much better gardening success rate than me. By the way--Happy First Day of Spring! Wednesday was shopping day. Here we are only days from spring and the "seasonal" section of the supermarket was all decked out for summer. Excuse me, but we still have an entire season to go before we get to summer. But the one thing I was eager to investigate was the seed rack. For several years, I've been trying to find Kentucky blue (pole) beans. I've only been able to find Kentucky wonder, which were good, but not as good as the Kentucky Blue. Yup, the store had them, and I bought three packages. I usually grow potatoes in a bin, but this year I think I'm going to put them back in the ground. Instead, I'm going to try to grow leeks in the bin. It's the same principal, you cover them up as they grow, so they'll grow taller. This should be fun. Meanwhile, tomorrow I'll be talking about some other plants. Stay tuned. I MEANT to grow them that small . . . The veggie garden is done for 2009. The other day I picked the last of the beans (and what a magnificent crop it was), the peppers, and the lone squash. The tomatoes were history about a month ago. The heirlooms succumbed to the blight--so we didn't get to eat even one of them, but the celebrity tomatoes were magnificent. Oh, they got the blight, too, but they were made of hardier stuff and if you cut out the black bit, were just fine to eat. And of course, Mr. Groundhog completely destroyed the Brussels Sprouts and broccoli, so I won't even go into that heartache (again). But getting back to the peppers . . . we got one full-sized (and that was on the small side) pepper, which I allowed to fully ripen. It was a beauty and I lovingly tended it for about 6 weeks. One other plant produced a pepper, but it rotted on the stem. Then in September, the second plant suddenly bloomed and the next thing you knew, we had three tiny peppers. There's the rub--they were TINY peppers. And so was the acorn squash. I got that as a freebie from the local nursery. We bought some annuals and they gave away one free squash plant. Unfortunately, I put the little squash in the driest part of the yard. I faithfully watered it, but the water seemed to flow downhill away from the squash. 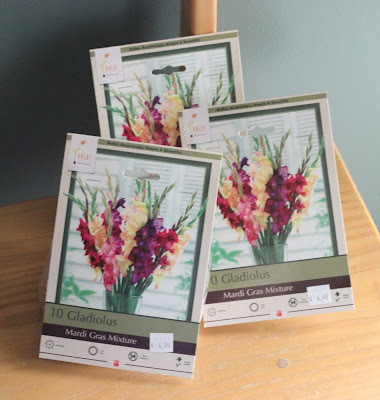 Still, I got some beautiful glads, so I can't complain too much. Hubby couldn't get over how darned cute that little squash was. To convey the size, I figured I'd better include something to give it scale. We haven't eaten the squash yet--and I wonder will we get get a teaspoon each--but it is awfully cute, don't you agree? I’m afraid my family sees my efforts to raise potatoes as rather a joke. After all, you can buy a five pound bag at the grocery store for less than $2. And I must admit my yearly yield isn’t much more than a couple of pounds. But that’s not why I grow them. I grow them for the enjoyment of eating something I have grown. And, as my husband pointed out, every vegetable we grow is free of pesticides. What’s wrong with that? I tried planting potatoes in the ground and not only did I not have a great crop, but it was difficult to find them all. So, for the past couple of years I’ve been growing them in a big plastic tub. As they’re confined to a small area, naturally there won’t be hundreds of potatoes, nor are they tremendously big. Some years my potato plants have flowered, but most years they have not. I keep thinking that one day I’ll read up on potato husbandry, but there’s usually something more important (like keeping us in clean laundry) that needs to be done. That night, I boiled the smallest potatoes until they were tender, drained them, and dumped a big gob of butter into the saucepan, along with a handful (about a third of a cup) of chopped fresh parsley (also from the garden) and mixed it all together. 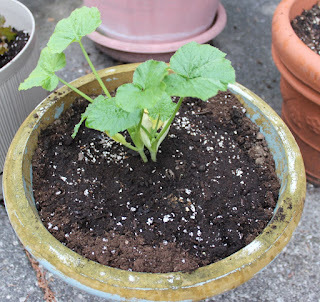 Since I blogged about my garden the other day, especially about how much I love green beans, I thought I might share how I cook them. I first ate these beans at a Chinese Buffet. In those day, they added almonds. I haven't seen them cooked that way in quite some time, but that doesn't stop me from fixing them that way. First, I get out a skillet and put in an inch or so of water. Plop the washed beans in the water (I like them whole, but you can cut them in segments or French style) and bring to a boil. Cook until tender. Drain the water and toss in a tablespoon or two of olive oil, and a tablespoon (or more) of either slivered or sliced almonds. Cook until the almonds are browned. We also eat the beans boiled with dried onion and rosemary. I put in a tablespoon or two of dried onion, and a couple of pinches of dried rosemary (fresh is always better) and boil until your preferred level of tenderness. As you can see, I'm not big about measuring for these recipes. Considering we've had a very yucky summer--weather wise--our gardens have had a wonderful season. From the perennials to the annuals to our crops. After the horrific hail storm in late June, we were afraid we'd lose most of our veggies, but Mother Nature is strong, and all of them (even the heirloom tomato seedlings) rebounded magnificently. (This little guy is the biggest of 11--I'm hoping some of them will ripen before the end of the season (I started them reallllllllly late.)) I can't quite remember what a ripe one looks like. (I bought one at the farmer's market and saved the seeds.) It'll either be purple with green stripes, or green with purple stripes. The potato plants are starting to shrivel up, which means that in a week or two, I can harvest my crop. Okay, usually my crop is extremely small--in both size and number of potatoes. Still, I enjoy growing them. I usually do them in a tub (as pictured), but this year I also planted some in the ground. Those never came up, so whatever we get--we get to eat. Our broccoli didn't do well. From five plants, we got enough for one meal before it started going to seed. 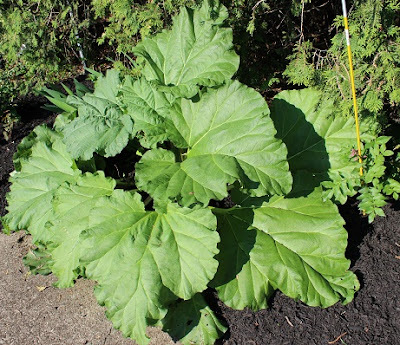 The Brussels sprouts are just starting to form and the plants are getting huge. Hard to believe they were plants with only two or three leaves when we planted them. One of my parsley plants didn't make it, but the other has been fantastic and we've eaten a lot of parsley potatoes this summer. Of the four pepper plants, only three have one pepper each. One of them is HUGE, the other two are tiny. 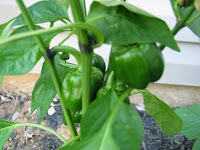 I'm thinking of trying jalapeno peppers next year -- maybe from seed, as the pepper plants I've bought for the last couple of years have not done well. As I mentioned above, the flowers have done really well. Back in June, my Dad remembered he had a bag of glad bulbs in his garage he'd forgotten to plant--TWO YEARS AGO. A very BIG bag of glad bulbs. We picked through them and I planted at least 60-70 of them. Not many came up, but the ones that did are magnificent. Yesterday I picked a red one (which I neglected to photograph) that is scarlet red with white in the center. Here's a longer shot of the garden at the end of the pool. My bean crop is suffering. Between not enough rain, hailstorms, and too much rain, some of my plants are stunted. Can you guess what is in their future? Yes! Cow manure tea! I'm also going to give my cosmos a shot, too. They've been in the ground for six weeks and they've hardly grown at all. Other people have cosmos and they're tall, willowy, and FULL of flowers. Not mine. Not ever. Yup, today's the day for a nice cup of cow manure tea. Oh, wow! My first tomato of the season. This is from the celebrity "vines." I have a bunch of flowers, but so far only this one little tomato, which is about the size of my thumbnail. But hey, they have to start small before they get bigger, right? * No sooner did I type this, than hubby called me out to show me two more. (On different plants.) Yee-ha! I see many BLTs in my future. We had a terrible thunderstorm with hail last Friday, which I wrote about in yesterday's Writers Plot post. (You can find it here.) 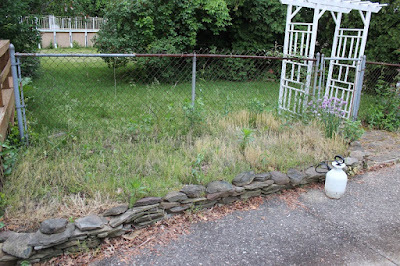 The garden suffered a LOT of damage and we were pretty upset about it. So on Saturday, when I started out on my weekly Garage Sale Hunt, I wanted to find something fun to cheer me up. As I walked back to the car with my wonderful find, my husband commented, "These are the things that cause divorces." Okay, so a pink flamingo is a cliche (and this one is so pink it's almost purple), but after the angst we went through over the garden (which is bouncing back, thank goodness). I wanted. I needed it. And at 75 cents -- what a bargain! Today's guest is Mary Jane Maffini, author of the Charlotte Adams (professional organizer) mystery series. Perhaps it was the climate, but I never so much as spotted a peony when I was growing up in Nova Scotia. The first time I saw them, I was a young teacher and a tiny girl in first grade brought me a bunch of delightful deep pink beauties for my desk in June. I was struck, no, make that besotted, and possibly even bewitched, bothered, and bewildered. Of course it was years before I had a garden of my own but when I did, whammo, in went peonies. New ones, heritage varieties, pale pink, white, deep fuchsia, you get the picture. They need to be planted just so, not too deep, not too shallow. They need sun; they need ants. Whatever it takes, I said, I'll do it. I had to have them. And how did my darlings repay me? Well, let me tell you. Peonies usually bloom in early June in Zone 4 which is where my Ottawa peonies are. They allegedly continue flowering for several weeks. For years I had jobs that required me to be at conferences for a week every June, although never the same week. For nearly a month I would watch the buds grow, flourish and bulge. Then just as I would be heading out the door to fly off to the Canadian Library Association conference, or the Special Libraries Association gathering, or the Canadian Booksellers Association educational sessions and trade show, I could almost hear the sproinging sound of petals bursting open. Perhaps there would be a tantalizing glimpse of a half-opened bloom. Then my taxi would zoom down the street and I'd be gone. I'd return to find millions of white, pale pink and deep fuschia petals lying inches deep on the ground and the spent plants gasping and ready to pack it up until the next year. But now I work at home, allegedly writing. My conferences are in May except for Bloody Words one weekend in early June. My peony problem should be well in the past. But no. Not so fast. This year I headed out to Book Expo America secure in the knowledge that the peonies were not ready. Bloody Words followed the next week and they were just gearing up. I rubbed my hands in glee. This was going to be the best crop ever! Hundreds of buds all looking vigorous. And I was home, happily writing in my little office with plenty of time to enjoy them, taking a cup of coffee in the morning, and promenading by proudly. The little scamps must have been playing games with my head. 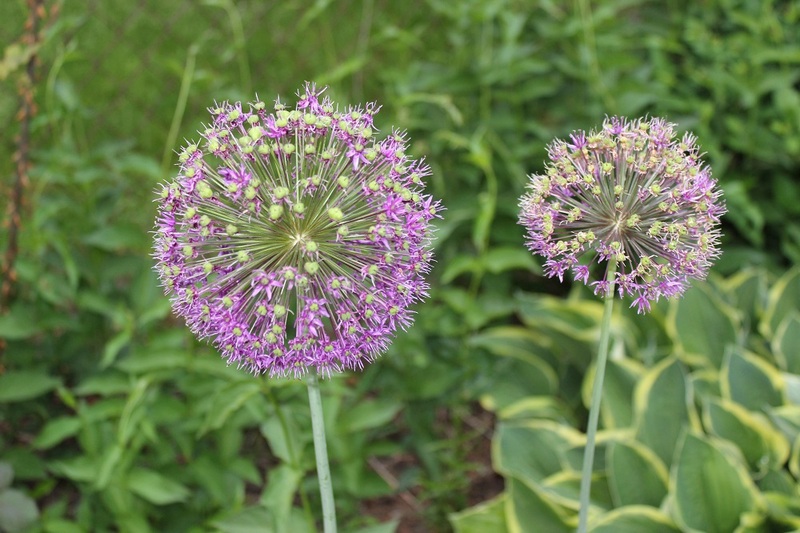 As I finally left for a family road trip in the third week of June, long after the peonies should have flowered, the blooms were getting ready to pop. One had unfurled in a provocative, even seductive manner. Maybe they can hold off until I get home, I thought, seeing as they are already well past their normal blooming pattern. Anything is possible. Three days after I left, I called my husband who was watching the fort, which includes my tiny garden. "Please check the peonies," I said. "Peonies," I repeated, jaw clenched. Long pause. "Are they the ones with the big beautiful flowers?" "They're blooming, all right. There are hundreds of them. They're gorgeous." I'll be home a week from today and once again will get to see a zillion petals on the ground. Why do they do it? And how do they know? "Take a photo please," I sniffed, "and email it to me. At least I can get to see them that way." "But you have the digital camera with you," he pointed out. I think it's all part of the great peony plot. These flowers are not to be trusted. Am I peevish? No kidding. I may be defeated, but it's not too late to plan for next year. This time, trust me, peonies, this means war. And what's bugging YOU today? When not staring morosely at her peonies, Mary Jane Maffini writes the Charlotte Adams mysteries, the Camilla MacPhee series and the Fiona Silk adventures. Visit Mary Jane's Web site. her at . Her latest book is Death Loves a Messy Desk. Check out her latest book trailer here. To hedge my bets, I planted beans in the ground, but also in a big container. So far, the container beans are outperforming those in the ground. Go figure. I figure they're going to start climbing before the end of the week. This is the first year I've grown lettuce, and again, to hedge my bets, I did it in a little container. I'm hoping we'll be eating fresh lettuce by the end of the week. That pot on the bottom contains one of my heirloom tomato "seedlings." I had them in little containers and decided last week they were big enough to have their own pots. (Actually, there's two in this pot--I ran out of pots.) They're doing well, albeit late, and I'm hoping to have at least a few purple and green tomatoes before the frost. Who knew gardening could be so much back-breaking fun. I love my new camera. I've had it for about two months now, and I'm really getting back into the swing of taking it with me wherever I go--just to get a grab shot. (Like yesterday's pig pictures--yes, I only put one up, but I took a LOT more.) My camera holds over 300 pictures, but it always seems like I'm on the verge of a purge. I've taken a lot of pictures of the yard. I like this picture of violets. They're so delicate. Frank considers them a week, and yanks them out when he sees them, but I think they're pretty--at least when they're blooming. The lilacs were particularly beautiful -- a MONTH AGO, but I never had an opportunity to show them off . . . until now. (Do you think I have a thing for purple flowers?) They smelled really nice, and Frank called his sister in Florida, who loves the scent of lilacs, to brag about it. Now they're gone, but we have our memories -- and pictures, too. For the first time in a long time, I'm really gardening. Veggies and flowers. Of course, every time I plant vegetables, I've been heartbroken. Despite the fact bunnies and groundhogs have decimated my veggies in years past, I still want to get out there and try it every year. And this year I've done it in a big way. My very first veggie garden was a thing of beauty. My Dad and I planted it at my first house and I had tomatoes, green peppers, broccoli, and Brussels Sprouts. Guess what? That's what I planted this year, too! I spent a lot of time on Monday working on "my little patch" of the yard. (Frank usually does 90% of the garden, choosing the annuals and planting them.) Right now I've got what was supposed to be a climbing rose. It's been there at least four years and has not felt inclined to climb. It had a sister bush, but it died. I think it's returned to root stock, but it does put out one or two brave roses a year, so it stays. (Frank wants to rip it out and replace it.) Last year, I put a hosta in there, and it did okay. This year it said--whoa! I like being here! and has taken off. I was going to put an azalea in there, but decided it would look too crowded, so this year I put in about 40 gladioli (which haven't done anything yet--and probably won't until nearly September) and six begonias. Then I mulched the heck out of it. It looks nice and tidy, which it hasn't done for some time. Here's a shot of the new bird bath. (That's my little pot of lettuce on the left, and a Japanese lantern my Mom gave me. Isn't it cute? That's the veggie garden in the background.) We'd been looking for a bird bath like this for at least six years. Nobody seemed to be carrying them. We thought it was be fun for the cats to watch birds up close (kinda like CAT-TV). Last summer, Wegmans had a little brass (or something like that) bird baths and, as we were desperate, we bought one. But we only saw birds use it once--in some kind of frenzy, and that was it. My mother bought one, too, but the birds didn't like hers, either. I drove around for about an hour with the new bird bath in the back of the minivan while I did other errands, and it wasn't until I got home that I discovered a wasps nest inside the base. Yikes! It's installed, with nice clean water. Now to see if the birds find it. The yard is shaping up. Just have some mulching left to do (and get out the leaf blower to clean up the last of the arborvitae leaves that dropped) and we can enjoy our garden for the rest of the summer. And I can get back to working on the book. I'm up to my elbows in alligators, with no time to blog today (or yesterday), but I thought I'd at least post a picture. But you can also check out my rant on Writers Plot. For several years now, we've been saying, "We ought to do something about the mess in the front of the house." But things came up, winter came, stuff like that. Finally, it just got out of control. Not only were the things we didn't want getting out of control, the weeds were huge. It finally became time TO DO SOMETHING. It was a big surprise to me when hubby announced, "I've contracted to have the front of the house cleaned up." What? Without my input? (Slow boil.) But, okay--it was such a mess I was willing to go that way. Until I found out that my favorite rhododendron was to be KILLED. Chopped up by a chain saw. Ripped out by the roots. Nope, it was going. Hubby was adamant. So one day last week, landscaping guys came. A day early--before 8 a.m. Backing up the driveway with a big truck filled with dirt. Yes, they started with the chainsaw and ripping out everything (including my daffodil bulbs!!!) but the were NOT going to kill that rhododendron. So off to the backyard I went and starting digging a very big hole. I was prepared to move the bush myself, but was grateful when two of the guys did it for me. Of course the big question now is, will it survive? Only time will tell. I was amazed how fast the guys transformed the "mess" into a nice tidy area with hydrangeas, hostas, three NEW rhododendrons, a ninebark, and a bleeding heart. It's a bit stark yet, and I imagine it'll take a couple of years before things "fill out." (I'm also wondering how long it'll take before the guy who plows our drive in the winter rams into the rock on the far right.) But no doubt about it. It's tidy. Of course, now I'm thinking . . . maybe we should add shutters. Repaint (new color)? And . . . and . . .
For years I've wanted to have a veggie garden. Okay, hubby gave us some space in the middle of his flower garden, but the beans were here, the tomatoes there, the potatoes somewhere else. I wanted a dedicated garden for growing my own vegetables. This year, my wish is coming true, but it took a lot of work to get there. First off, we had a 30 foot maple tree that was in the way. Now, I love trees and it makes me sad when one has to be taken out, but this tree was A) too close to house B) too close to the pool (which meant that spinners, stems (it was a weird variety of maple) and leaves would get in said pool and foul up the filtration, and it shaded the pool, keeping it too cold to swim in. And most of all--it was in the very spot I wanted to put my veggie garden! So, the tree came down in 2008. Tree man agreed to come take out the stump when he had a chance. The chance came in March 2009. Oh boy! I was finally going to get my garden. Not so fast. There was a pile of chips and dirt nearly four feet high to deal with. So I got out my little garden cart and started trucking them away, putting them in the far corner where I wanted to kill off some aggressive ivy. (Did the trick, too!) However, after 25 cart loads, there was still half the pile of chips and I couldn't seem to dig through the pile. So, since we were getting the front of the house re-landscaped (another story), hubby contracted for the landscaper to clean up the chips. Easy, right? It seems that tree/stump man underestimated the root system. And really, who could blame him with that nearly four-foot pile of chips he was trying to work around. So, landscaper guy called his stump guy and off he went. It took him more than an hour, and even then, he had to take out an ax to remove the roots nearest the pool's concrete deck. But, since that had taken so long, the rest of the team had gone off to work on another job. "We'll be back tomorrow." Tomorrow ended up being 3 p.m. -- not 8 a.m. And there was also the threat of rain. Next day, the guys came back and did their work. Stone guy built a little wall so that they could put fresh dirt in the area to give us room to to plant. The guys didn't lie, they finished the job in a little over an hour, and they did a terrific job. Everything was ready for planting. I already had my broccoli, Brussels Sprouts, tomatoes, cilantro and curly parsley. There was just one problem. So finally I planted MY garden. All but the beans. (I like to soak them for 24 hours before I plant. It gives them a jump start.) Only now I'm worried about critters. I've had gardens decimated by groundhogs and bunnies and I don't want that to happen to my garden. My friend Heather Webber (who writes a gardening mystery series) puts carrots out in her garden. The bunnies eat that and leave her veggies alone. My friend Kaye George swears by Cayenne Pepper. I'm doing both, and hope that the critters leave my veggies alone. I've had a new camera for a couple of weeks now, and have been eager to start taking pictures once again. And after that "long, cold, lonely winter," the spring flowers are a welcome treat. Next to the rhodo we have a little stand of daffodils. They're the spring plant that keeps on giving. They've been out for over a week, and we've had a couple of really hot (Wonderful!) days, but they're still pert and perky. (I have to learn which setting gives me a sharper background. Hey, it's only been a couple of weeks--give me time, give me time! We didn't plant the tulips out front -- and usually we have only one straggly bloom, but this year we had more--go figure! (And I'm certainly not complaining.) Sadly, tulips seem to last a day or two (especially if it's hot). As you can see, they're already getting a little brown around the edges, and they'd only been open a day. Of course, while spring is great for flowers, it's also great for weeds. Why do they look so pretty when they flower--and so ugly when they turn into puff balls of seeds a day or two later? I stopped using my SLR camera about ten years ago and almost exclusively used a point-and-shoot. And when we got our first digital cameras, they, too, were point-and-shoot. I've only had the new camera a couple of weeks, and have realized how much I missed taking really good pictures. Now to learn to use the thing to its full capacity. It's been a good summer. I got to take my parents to the family cottage twice this year (for a total of six days/five nights); I did a whirlwind book tour of New Hampshire, and my attempts at gardening have produced a considerable amount of veggies. Okay, I love flowers, but were I to have the garden of my dreams, it would be 90% vegetables. There's something really satisfying about planting, nurturing the plants, and then harvesting veggies that either came from seeds or from tiny plants. Okay, anybody can shove tomato plants in the earth and then neglect them, but unless you take care of your plants, you can't predict a successful outcome. I planted my bean crop on Memorial Day weekend--here at home, at the cottage, and at my mother's house. Waiting for pole beans to mature is like waiting for your first crush to actualy NOTICE you. It takes FOREVER. Then all of a sudden, you're up to your eyeballs in beans. Holy crap! As soon as I pick them in one location, another location is overproducting. The beans shown here are my home crop. (Can you say blanch and freeze?) I grew them in container pots here at home because other years I had such trouble with bunnies devastating my baby plants when I put them in the earth. The bunnies didn't get them this year, but squirrels did dig up the containers early on. I ended up replanting three times in order to get 10-12 plants. And they have thrived. So much so, that when I put the piggy watering can on the picnic table bench one Friday, I came home from the cottage on Sunday to find the beans had grown around the piggy's handle, and beans were hanging like clothes on a wash line. My potato crop wasn't as marvelous as I had hoped. I planted three seed potatoes, cut into 6 parts, but only three plants actually grew. They did better than last year, but not a good as 2006, when I used potatoes from my pantry that had grown eyes. This was the entire yield, but the beans shown in the same picture were just the pickings from one day. Five days later, I picked as many beans, which was enough for the two of us for supper. We cut parsley from the yard and, after boiling the potatoes, added it and a big slab of butter for parsley potatoes. Yum! I've got a huge basil plant growing, but I haven't decided if I should just dry it or make pesto. Decisions, decisions. The tomatoes have been slow to ripen, but we've already had a bunch. They're wonderful, too. (Celebrity variety.) I went to the local farmer's market last week and bought an ugly green-reddish heirloom tomato. I scraped out a bunch of seeds, and next year I hope to grow some of the same tomatoes. I've only grown tomatoes from seed once, and the results were nothing to brag about. I'm hoping next year will be another story. Meanwhile, the bean jungle continues to produce. Hubby is already sick of beans, but I could eat them daily for at least six months before I tired of them. The garden is coming back to life. It's wonderful to go out there every day and see something new has popped up or is blooming. These are one stand of our Irises. Every year they seem to change color. Last year they were a deep purple. Aren't they pretty? The weather has finally turned fall-like and since they were harvesting squash in the farm behind us, I decided to head out to harvest my potato crop. The plants had finally shriveled to a point where I could pull them out of my "bin." (Which holds about 50 lbs of dirt.) Next step, empty the dirt out onto a tarp. This sounds easier than it is. First of all, I wanted to do it close to the house, because I wrap up the bin and keep it in my enclosed porch over the winter. So I had to haul this million pound bin over the water bags and tarp covering the money pit (pool), and then dump it. Only, the dirt was pretty compacted, so I had to get out a trowel and empty it tiny shovelful by tiny shovelful, being careful NOT to stab my potatoes. Hey, there actually WERE potatoes, despite the fact only two of my seed-plants sprouted. (And I found the rotting remains of what did NOT sprout, too. And where'd that rogue red one come from?) I got three really BIG potatoes, but they were covered in "scab." Not to worry. I peeled it off, yanked out some fresh parsley and it tasted just fine (with a bunch of the teeny tiny ones tossed in as well). Overall, though, the results are...laughable. Next year we're going for "professional" seed potatoes from the Mennonite store in Seneca Falls. Then we'll see who laughs at my next crop! Things on the gardening front haven't been going that well. Things are growing, but despite the weather (which has been wonderful for plants), I'm disappointed. Not with the flowers. Wow--this has been a great year. My old (5-6 years) rose bush has done nothing but bloom all summer. It's gorgeous. Tiny delicate pink flowers that I can see out my window. For most of the summer my new climbing roses did nothing. In fact, a few buds faded away. Yikes! I had aphids! A puff of aphid powder later and now both are blooming. Not a lot, but they're very cute and I'm hoping next year when they're really established, they ought to be just as wonderful as the other bush. All the annuals look great, too. The weeds are pretty much under control (thanks to mulch). It's my crops. Here we are in mid-August and I've only had one flower on my sickly looking pepper plants. It was there for one day then gone. So I don't know if I'll get any peppers. The tomatoes never took off. The plants are small and so is the fruit. (We've only had one ripen so far. It was good, just small.) My potato plants are BIG (the two of 7 that grew), but they haven't flowered. Okay, I did plant them late, but the potato fields in Savannah (NY) were in flower weeks and weeks ago. It's the bean crop that has me most concerned. Killing almost 300 Japanese beetles in less than 48 hours was exhilarating and disheartening all at once. I'm glad I got rid of the little buggers, but what happens to my poor plants while I'm away from them? I did harvest 4 entire beans last week (to hysterical laughter from Frank), but I've got tons of flowers. I just hope the beetles don't decide they taste as good as the leaves. There were about a hundred little beans from 1/2 to an inch long on Sunday. I'm looking forward to seeing how much they've grown and if they're ready to be picked. I would've made a terrible farmer, but I get a lot of satisfaction out of growing vegetables. I try not to peek through the arborvitae to the farm behind us. Their (professional) productivity (melons and cabbages this year) can be depressing. Things were going very well in my home bean farm. Just yesterday morning I went out to gaze lovingly at my little bean crop. I was disappointed that of the more than 100 seeds, only 26 sprouted, but they were fine seedlings. And even better, they were starting to climb. So off we went to Home Depot to buy more mulch to put around them, so they wouldn't get so dry. We ran a couple of other errands as well and when we came home... 21 of the 26 plants were GONE. BITTEN DOWN TO THE DIRT--yes even below the mulch line! I put sticks around the remaining plants, but the bunnies got around the sticks last year. Not a flower, not another green blade of ANYTHING was gone, just my beans.